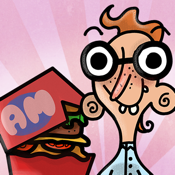 Take part in a really funny and enjoyable fast food party game! Try to serve them as long as you can. Pick a bag from the left shelf(TAP THE BAG), and choose a suitable food for it(TAP THE FOOD) or without the proper food drop the bag to the trash(TAP THE TRASH). You can only give the bag filled with food to the kid only if he is tend to eat it(TAP THE KID). You can also eat it if you wish(TAP YOUR FAT METER). The fat/calorie level is changing according to the amount of eating food. If it gets too high they won’t eat anymore. If it gets too low… well, it will come to no good.